Renewable energies sources (RES) consumption reached 15.9% for final energy consumption in Spain in 2014. The final objective for 2020 is 20%. 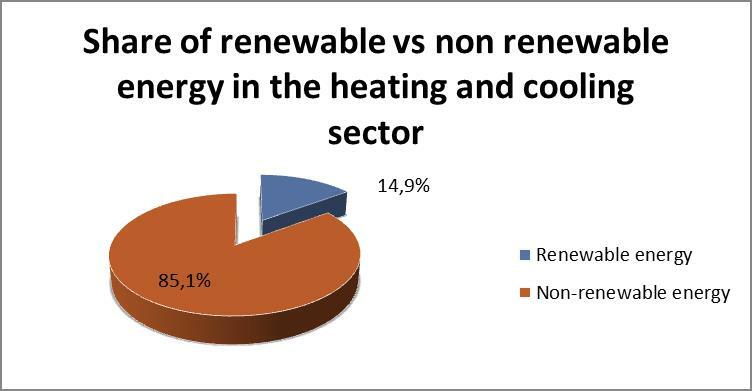 The penetration of RES for heating and cooling uses is still slow in Spain mainly due to economic crisis. However, some technologies have experienced an increase in the last years and the perspectives in the short term are to intensify the use of thermal RES for heating and cooling. The current use of RES for heating and cooling is limited. The RES share in the final energy use is 6,6% (in 2013). The main sources of RES heat are: wood stoves in houses, large biomass boilers, willow geothermal heat pumps, air to air heat pumps and solar thermal installations. The use of RES for cooling is limited to heat pumps. The use of RES in the residential and the industrial sectors is quite relevant; the following table shows the contribution of RES to final energy consumption. Biomass was the main technology contributing to this objective (4.1%). Despite a slight reduction of the contribution in 2014, the tendency in the last years is positive for this technology. The biomass thermal sector (including biogas for thermal uses) accounted for 3,340 ktep in 2014, mainly for residential uses. uted in 0.3% to the total account. The contribution of geothermal energy to thermal uses is very low. 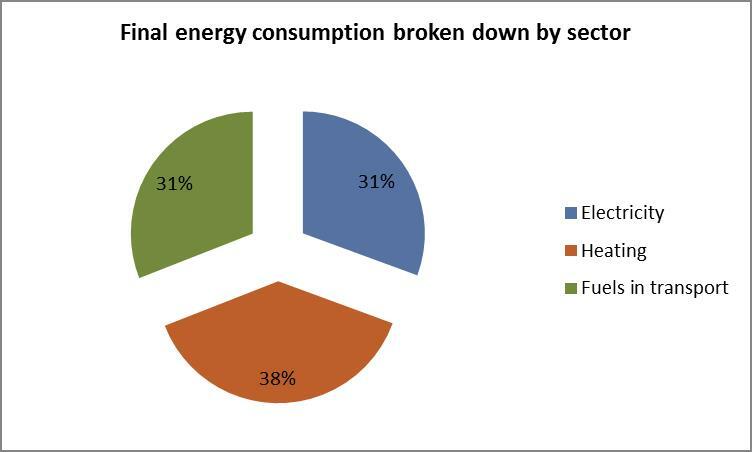 In 2014 it accounted for 19.7 ktep (0.02% of the total final energy consumption). In the last years the development of this sector in Spain has risen. The Spanish Government approved in several measures intended to encourage the energy efficiency of buildings, which to some extent represent supporting the installation of thermal renewables in the residential sector. During 2009 and 2010 (ongoing) under the 2005-2010 Renewable Energy Plan, the funding programmes, called BIOMCASA, GEOTCASA, SOLCASA and GIT, started. The programmes BIOMCASA, GEOTCASA and SOLCASA finance RHC facilities in buildings, operated by Energy Service Companies (ESCOs). During 2012 and 2013 new calls of the programs have been re- edited. The GIT program is addressed to incorporate RES in industrial processes. In October 2013 was launched the PAREER Programme – Energy Refurbishment in the Residential Sector. Within this program, the Ministry of Industry, Energy and Tourism through IDAE, provides financing to the owners of residential buildings and hotels and also to ESCOs providing heating and cooling to the final users. IDAE (Institute for the Diversification and Saving of Energy) was established in 1984 as a state-owned business entity that reports to the Ministry of Industry, Energy and Tourism through the State Secretary for Energy. IDAE is the responsible authority within the Ministry for the Renewable Energy Plans (the present one 2011-2020) and for the Energy Saving and Efficiency Strategy 2011-2020, and is in charge of developing and submitting to the Secretariat General for Energy of the Ministry of Industry, Energy and Tourism the follow-up reports and revision and proposals of all the necessary actions and applicable technical solutions during the Plan’s temporary limit to achieve its targets. To identify at national level the strategic policy priorities that can contribute to efficiently and cost-effectively implementing the NREAP. It implies an exhaustive study of the key decision factors for end-users, market conditions, technological potential and regulatory framework of the country. To facilitate the setting-up of improved and sustainable RHC integrated support schemes, stressing the value of the energy provided. To support a better insight of the value of the energy supplied by RHC systems, promoting transparency and clarity for end-users and other stakeholders.